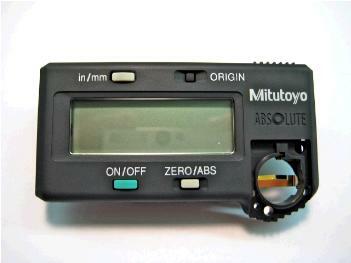 Mitutoyo does not sell parts directly to end users. It will be necessary to place your order through an authorized dealer such as Long Island Indicator Service. You can check the Mitutoyo web site or give them a call to find a dealer in your area. We only have a limited selection of parts available for sale and—if you know the part number—these can be ordered on page 187. How to find the part numbers? Detailed parts breakdowns and parts lists are available for most models at the Mitutoyo web site. Check those parts lists carefully. Parts ordered in error can not be returned or exchanged. Be aware of model and code numbers! As Mitutoyo gages, calipers and micrometers evolve, the manufacturer adds new suffixes such as -20, or -30. This little detail must not be overlooked when ordering parts. On older gages it is also important to look for the serial number since parts can be different. The model number is always printed somewhere on Mitutoyo gages. On digimatic calipers you will find it on the label on the back of the gage. It is easier to look for the hyphenated code number than the rather confusing model number. It may be economically prudent to simply replace the calipers with a new model. Calipers are only as good as the condition of the jaws allows. If you see gaps in the jaws or bent tips then it's high time you move on. New models and current specs can be viewed on page 135. Just about the only thing you need to do when your digital calipers no longer work, is to replace the reading uint. In most cases, replacing the reading unit couldn't be easier. There are four screws that hold it in place, from behind. You will probably have to remove the sticker with all the model information that covers the back of the caliper. Use a razor blade and a little solvent to pry the sticker off (watch your fingers!). You may want to re-use it when you're done. A small Philips screw driver undoes the unit. Then you may have to remove the roller hook which is also held in place by another screw. Now the old unit just lifts off. After the new one is screwed in place, you'll want to put the battery and battery cover back on. You will need the old battery cover because new units don't include these. There may be enough sticky gum left on the label that you can just glue it back on. Otherwise, some two-sided tape, or a bit of silicon will do the trick. You will probably be pleased as punch with your own efforts. For example, reading unit assembly 09GZA253 (shown above) includes the "works" but not the battery nor the battery cover. It's a good idea to buy those separately when you install a new reading unit.